The Crossing is a delightful recounting of George Washington’s journey into becoming one of the most memorable men that has ever lived. The Crossing begins with the battles at Lexington and Concord in Boston where the American forces triumphed over the British. This was the infancy of the Revolutionary War. Knowing that the British would come back from their great loss, retaliating with a vengeance, the colonies needed a strong leader to command. John Adams suggested George Washington. At that time he already had an illustrious career as a military man. Washington accepted the position, but with reservation. He soon learned that he would have to fight with an army that was inexperienced and raw. Most were farmers and had little training. Washington would go up against General William Howe, who was a fierce and courageous fighter. Defeating him was going to be almost impossible—especially with the men Washington had under his command. They were undisciplined and unruly. When the sign of battle came, most of the men fled for their lives. When the battles became tougher, many of his men deserted. Washington was sure they were going to lose. Howe was outfoxing him at every turn. But then certain blessings came to Washington, fates of luck concerning the weather. Fog hid his men from view when they had retreated to a place of safety. Rain was also a factor that helped Washington. He soon realized that he could not defeat Howe the old conventional way: Howe had a more experienced army, well disciplined soldiers, and the respect of his men. Washington definitely had some work to do. But Washington was crafty beyond his years. He went to more of a hit-and-run approach in taking out the British. It was working splendidly for him. Without having to face his enemy in a head on battle this approach saved more of his men’s lives and brought confidence to his army. With the cunning and bravery of Washington, and with the help of some of his valiant generals, Washington was able to beat the British. The British signed a peace treaty that officially recognized the United States as a free and independent country. As for George Washington, he changed during the war. He started out as a man who could have failed at any moment, to a man who would lead our country toward what it is today. The Crossing retells in detail every battle and hardship that Washington had to endure during the Revolutionary War. It is a very interesting historical accounting. It shows George Washington’s ability to overcome the odds against an army that should have beaten him. With a ragtag amateur army, George Washington bested the enemy several times. This story speaks of George Washington’s leadership, strength and determination. He was indeed an amazing man. Though this story is a very serious accounting about George Washington’s journey through the Revolutionary War, it would have been interesting to see his other side as well. George Washington was a lover of animals. He had many pets. During the war, General Howe had lost his dog; it had wandered where Washington’s men had found it. Instead of hurting the animal, Washington returned it to its owner along with a letter. His kindness brought him some respect from the English people. After the war, George Washington was a well-liked man, which obviously led him into becoming our nation’s first president. He had definitely proven himself during the war, not just in his tactical abilities but in his humanity. The author, Jim Murphy, is celebrated for his engaging and carefully researched nonfiction for young readers, winning many awards for his works. Even children older than the targeted ages of 9–12 will love the history the story provides. 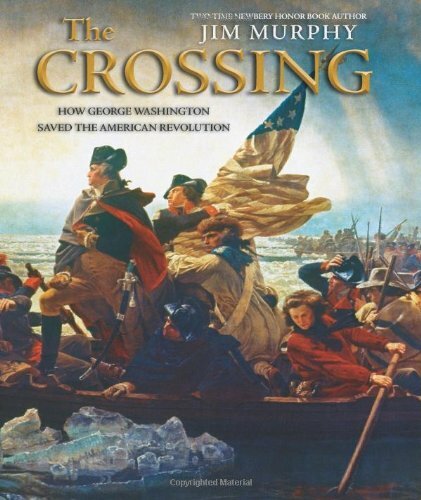 The Crossing also shows many pictures, the famous one being on the cover, Washington crossing the Delaware. In the back of the book is an explanation of the painting. There is also a brief timeline of the Revolutionary War, along with websites to further discussion. Overall, a great historical read of one of our nations great men.